Illuminates to warn the driver of a malfunction in the active torque control 4WD system. Blinks to inform the driver of the DTCs in diagnostic mode. Detects the wheel speed of each wheel. Detects the engine speed and outputs it to the ECM. Detects the throttle valve position and outputs it to the ECM. 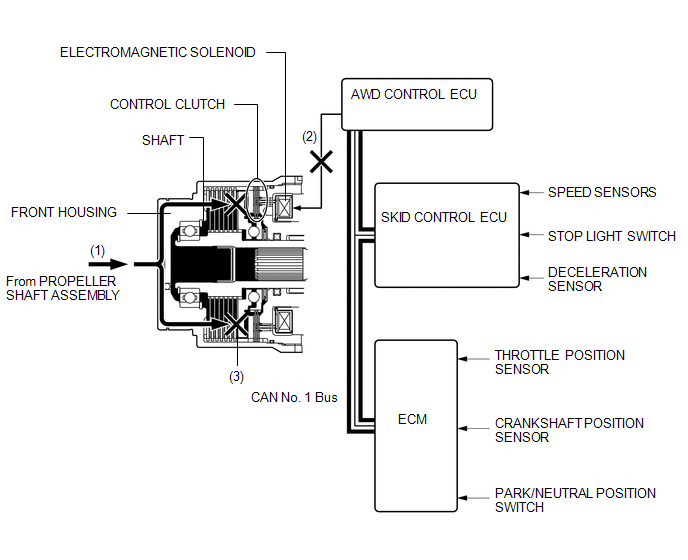 Detects the shift position of the transaxle and outputs it to the ECM. Detects when the brake pedal is depressed. Detects when the parking brake is applied. Drive force input into the differential is redirected 90 degrees and output to the propeller shaft by the transfer. Distributes drive torque in accordance with the amperage applied by the AWD control ECU. Controls the amperage applied to the electromagnetic solenoid based on signals provided by the sensors in order to optimally distribute drive torque in accordance with driving conditions. Turns AWD mode off when a parking brake ON signal is received from the main body ECU (instrument panel junction block). Turns AWD mode off when a shift position signal (P or N) is received from the ECM. Outputs signals such as the shift position signal, throttle position signal, and crankshaft position signal to the AWD control ECU. Outputs signals such as the vehicle speed signal and deceleration signal to the AWD control ECU. Outputs signals such as the parking brake signal to the AWD control ECU. (1) The drive force is transmitted from the propeller shaft to the front housing. (2) The AWD control ECU judges whether it is necessary to send drive torque to the rear wheels based on input from various sensors. When it is not necessary to send drive torque to the rear wheels, the electromagnetic solenoid is not operated. (3) The drive force of the front housing is not transmitted to the shaft because the control clutch is not engaged. (4) Accordingly, drive force from the propeller shaft is not transmitted to the rear wheels. (2) The AWD control ECU judges whether it is necessary to send drive torque to the rear wheels based on input from various sensors. When it is necessary to send drive torque to the rear wheels, the electromagnetic solenoid is operated. (3) It attracts the armature to the control clutch side. 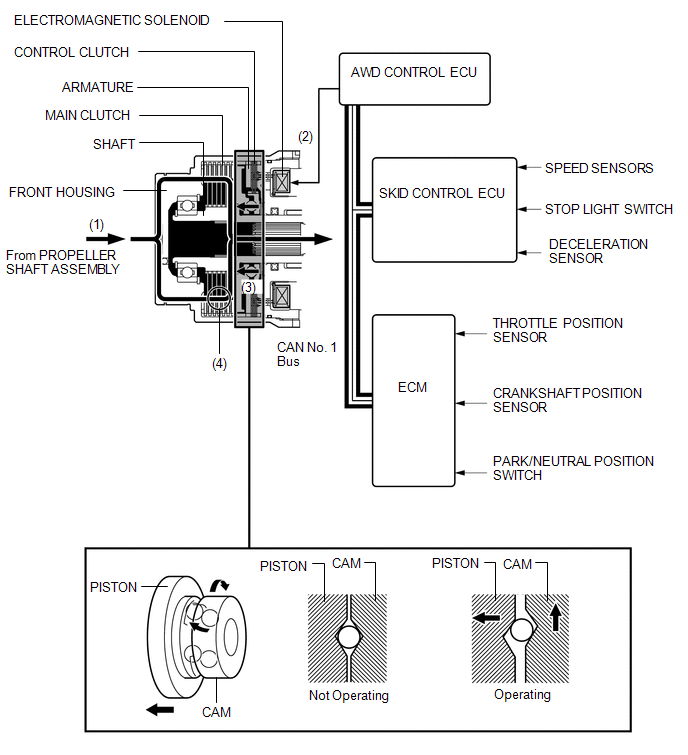 This causes the control clutch to engage and the cam to rotate. 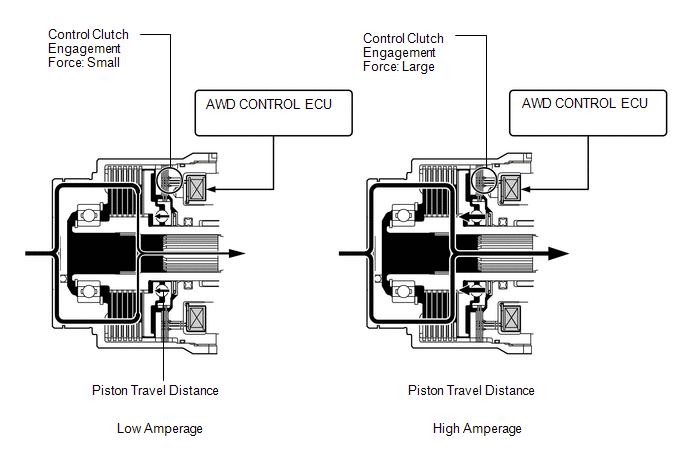 (4) The rotational movement of the cam causes the piston to push on the main clutch, causing the main clutch to engage. (5) The amount of drive force that is transmitted to the rear wheels is controlled steplessly by controlling the amperage that is applied to the electromagnetic solenoid. (6) Accordingly, drive force from the propeller shaft is transmitted to the rear wheels.